As some of you might know, my wife Kitty Tucker passed on the evening of March 30th. In 1963, at the age of 19, she was diagnosed with Hodgkins Disease and given a few months to live. But oh, what a life she went on to live as a mother, loving wife, and warrior for justice. By 1965, she was jailed in Alabama for trying to register African-American voters. She helped found a medical clinic for the poor that's still open, fought for women's rights, became an attorney and helped organize a successful lawsuit on behalf of the parents of Karen Silkwood, a nuclear worker, that ultimately prevailed in the Supreme Court. (Silkwood's life was made into an Oscar winning movie starring Cher and Meryl Streep). Kitty fought against food irradiation, and even in her later years was organizing to have the City of Takoma Park divest from banks supporting the nuclear weapons industry. The list goes on. Kitty had a constant struggle with ill health. She also survived breast cancer, survived having two heart valves replaced (damaged by rheumatic fever as a child), lived through chronic migraines and even managed to survive outliving the loss of her oldest child. She lived a long life and impacted many and will be missed. Most importantly, she raised her children with unconditional love and opened the door to a life of meaning for me. Kitty Tucker, an antinuclear activist who helped organize a high-profile lawsuit in the case of Karen Silkwood, the nuclear power whistleblower whose story was later dramatized in the Academy Award-nominated film "Silkwood," died March 30 at a hospital in Silver Spring, Md. She was 75. The cause was cardiac complications from an infection, said her husband, Robert Alvarez. Ms. Tucker devoted nearly her entire adult life to social and environmental causes as an activist and a public-interest lawyer. She participated in the feminist movement as a member of the National Organization for Women and during the civil rights movement was jailed while working to register African American voters in Alabama, her husband said. But she became best known for her work on behalf of Silkwood, a technician at a Kerr-McGee plutonium plant in Oklahoma who was contaminated by plutonium and who died in a 1974 automobile crash on her way to discuss with a New York Times reporter what she alleged were safety violations at the plant. An investigator for the Oil, Chemical and Atomic Workers Union alleged that Silkwood's car may have been forced off the road, a claim that was not proved. But her death, and the 1983 film directed by Mike Nichols with Meryl Streep in the title role, brought renewed national attention to questions about the safety of nuclear power. Ms. Tucker was a law student when she read news reports about Silkwood's death. While juggling her academic responsibilities and caring for her young children, she successfully lobbied the National Organization for Women to push for an investigation into the case. With Sara Nelson, NOW's national labor secretary, she founded Supporters of Silkwood, an operation headquartered at Ms. Tucker's home in Takoma Park, Md. The women used their own money to send newsletters around the country, The Washington Post reported in 1979. Howard Kohn, a journalist who covered the Silkwood case for Rolling Stone magazine and wrote the book "Who Killed Karen Silkwood?," described Ms. Tucker as the "lead organizer" of the lawsuit that pitted the Silkwood family against Kerr-McGee. He credited her with mounting a fundraising campaign for the effort and recruiting a legal team that came to include the celebrity lawyer Gerry Spence. "That turned what had been a quixotic piece of litigation into a serious piece of litigation," Kohn said. In 1979, an Oklahoma jury found that Kerr-McGee had acted negligently in allowing Silkwood to be contaminated and awarded her estate $10.5 million, including $10 million in punitive damages. In 1981, an appeals court reversed that part of the settlement, contending that a state jury could not lawfully award damages against a federally licensed nuclear facility. The U.S. Supreme Court reversed that decision in 1984, sending the case back to the lower court for further proceedings. Two years later, the parties reached a settlement of $1.38 million. "The point is that what Kitty started led to this precedent-making litigation and verdict," Kohn said. He said that he was "impressed by her passion," recalling the intensity that she balanced with a nonconfrontational style that he traced to her upbringing in the Midwest. "She didn't take no for an answer," he remarked. Kathleen Marie Payne was born Feb. 28, 1944, in Carroll, Iowa, and grew up in Clear Lake, Wis. Her father taught business at a local high school, and her mother was a part-time postmaster. At 19, Ms. Tucker was diagnosed with Hodgkin's disease and given a few months to live, her husband said. She later suffered from breast cancer. She received a bachelor's degree in sociology from the University of Wisconsin in 1967 and a law degree from the Antioch School of Law, now part of the University of the District of Columbia, in 1978. After her involvement in the Silkwood case, she served as executive director of the Health and Energy Institute, a Washington-based organization that campaigned against nuclear power, the irradiation of food, and other issues. Ms. Tucker's first marriage, to Charles Tucker, ended in divorce. Their son, Shawn Tucker, died in 1994. Survivors include her husband of 44 years, Robert Alvarez of Takoma Park; their two daughters, Amber Torgerson of Virginia Beach and Kerry Rochester of Eugene, Ore.; two brothers; a sister; and two grandchildren. In 1999, Ms. Tucker and her husband, who was employed at the time as a senior Energy Department official, were arrested after their daughter Kerry, then 16, reported them to police for growing marijuana in their home. Ms. Tucker, who suffered from conditions including migraines and fibromyalgia, said she used the drug for medical purposes. Alvarez was fired from his government position. He and his wife each pleaded guilty to a single misdemeanor charge and received six months' probation, a $150 fine and a suspended 10-day jail sentence. Their records were later expunged, Alvarez said. He attributed the action by his daughter to a "fit of teenage pique" and said that they bore no animus toward her over the episode. He said that his wife campaigned for the legalization of medical marijuana in Maryland, which took effect in 2013. 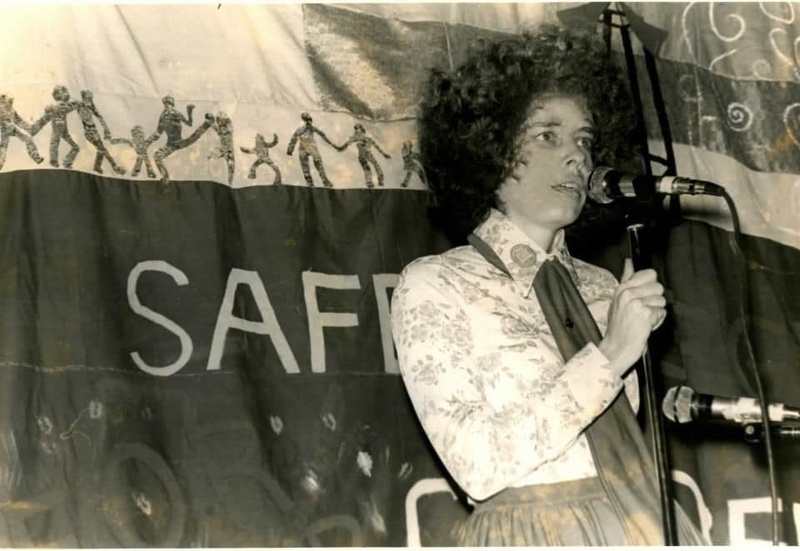 At her death, she was a member of the Nuclear-Free Takoma Park Committee.